General Awareness & Static GK is a good source for preparation of Bank, SSC CGL, UPSC, and railway and for other competitive exams. Study General Awareness from www.GovtJobsPortal.in and stay updated as well as prepare for General Awareness section which is asked in SSC CGL, UPSC and other competitive exams. Here we are continuously providing static GK for SSC CGL exam on various topics. Today’s topic on static GK is INTERNATIONAL AIRPORTS IN INDIA. Airports are the places where aircraft generally those carrying people take off and lands from one place to another place. These are the fastest mode of transportation in today’s world. A lot of people daily fly through the airplanes for their business or domestic purposes. 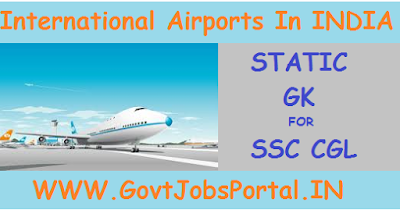 In this topic we are providing information about international airports in India, city, state and name of Airports. Below is the table showing all the details about the international airports with their location in India which the candidates can know. · The world’s remotest airport is Mataveri International Airport located on Easter Island in the Pacific Ocean, situated 3,559 km from the west coast of Chile. · The world’s highest airport is El Alto International Airport in Bolivia, which is situated at an elevation of 4,061 meters above sea level. · The world’s largest airport by passenger movement is Heathrow Airport in London, U.K.
· The world’s busiest airport by cargo movement is Chep Lak Kok International Airport in Hong Kong. · The world’s largest airport by traffic movement, that is passenger and cargo movement combined, is the Hartsfield – Jackson Airport in Atlanta, Georgia, U.S.A.
· The world’s lowest airport is Atyrau International Airport in Kazakhstan, which is situated at an elevation of 22 meters below sea level. · La Paz, Bolivia is the World’s Highest Airport – 13,325 feet above sea level.